The sun comes up over the Sierra Nevada mountains in the great San Joaquin Valley of California and lights up the Tule River near Porterville with its soft light and welcoming warmth. 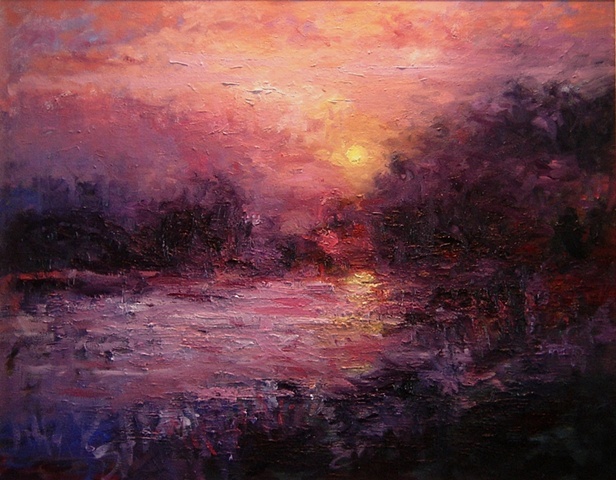 This painting in violets, deep reds, blues pinks and oranges depicts that first sunlight that comes over the mountains and illuminates the water. The paint handling is rough and immediate and captures the expectation of a newborn day.